A particularly tasty coca Pisco Sour from the Qespi Bar at the JW Marriott, El Convento Cusco. I have one piece of advice for anyone visiting Peru: Never ask if pisco comes from Chile. Peru and Chile have a longstanding rivalry when it comes to the clear grape brandy, which both countries claim as their own. And while I feel it unwise to take sides in a matter of international dispute, I will say that the good people of Cusco make some damn good Pisco Sours. The best among them? The coca Pisco Sour. Yep, that coca—the plant they make cocaine from. The plant itself is everywhere in Peru and neighboring areas. Historians have found evidence of coca leaf-chewing that dates back almost 8,000 years, and the Incas actually believed that the plant had divine origins. Locals greet tourists in Cusco—which sits at an ear-popping 11,200 feet above sea level—with coca tea, a traditional method for combating altitude sickness. It’s not going to give you the full stock-broker-in-the-‘80s experience, but you can get a gentle buzz going. As stimulants go, a cup of coca tea falls somewhere north of green tea but less than espresso. Does it actually help with the altitude? Who knows—but hey, after a few cups, I felt better. But back to the pisco. 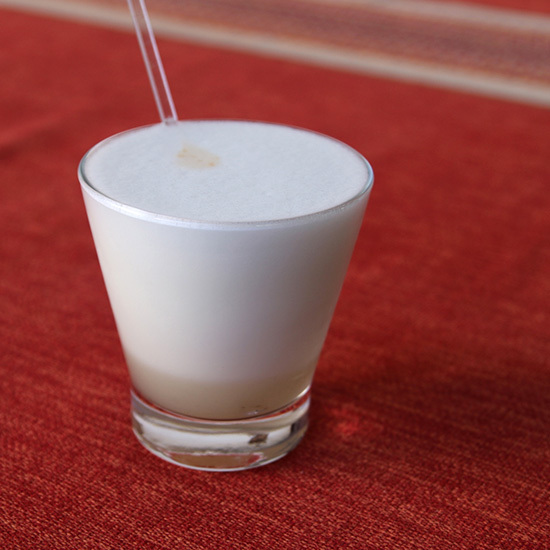 At the Qespi Bar at JW Marriott’s gorgeous hotel just off the city’s main square, El Convento Cusco, they infuse the brandy with coca leaves before shaking it into a classic Pisco Sour: lime, simple syrup and egg white for that distinctive foam on top. The coca itself has a mild, earthy-vegetal taste, somewhat similar to the yerba maté you'll find in Argentina.